Edited by: Thankful Sonali 12 WDC years! So, in "Still a Kid" , I copy-pasted a list by Jayne . In her response to that newsletter, she asked: "What did people do before copy-paste?" Her rhetorical, tongue-in-cheek question is the basis for this newsletter. What, indeed, did people do before copy-paste? Well, I'm so old I can actually tell you this. So I wrote by hand, using a pen, on a physical note-paper. You know the white one. I used either a ballpoint pen or a fountain pen, which I needed to fill with ink. If the secretary either deciphered my handwriting incorrectly or made a mistake, I used white-ink. White-ink came with a little brush of its own. You applied it, carefully, on the mistake, and you re-typed on top. Each time, for all the copies. If the copy-supervisor thought you'd done a messy job ... the whole sheet got re-typed. And re-proofread. Not just the mistake bit. Everything got re--proofread, because other mistakes may have occurred. So once we were doing this little booklet for this client who made stationery. I wrote copy, the secretary typed it out, we managed to get a reasonably clean sheet over to the client ... who crossed out a couple of sentences and changed them. Back to the old typewriter. This time, he changed a couple of other phrases that he had overlooked before. This went on a couple of times till the secretary threatened to resign raised an eyebrow at the client-servicing guy in charge, who took the hint and told his client the copy was now perfect and ready to send to the printer. Who then made plates out of it, and sent a proof for proof-reading. To those of you who were born after every desk had a computer, all this would be a lot of mumbo-jumbo. That whole way of living would sound like a mystery to you. Here in India, we go to college after Grade Ten, or Std. X as we call it. (Age about 15-16 years.) We have to choose one of Arts, Science or Commerce, if we're doing mainstream courses. Well, I chose to do Commerce, and enrolled in a small private college run by competent people -- a college which two of my cousins had attended before me. Those who owned that college also owned a Law College. And, this being prime land in the city of Mumbai (then Bombay), we didn't have much of a campus. In fact, we had no campus. Just a building, with a bit of a drive-way in front. And -- each of the colleges shared that building. One wing was our Commerce College, the other was their Law College. Believe it or not, mobile phones didn't exist in those days. You used phones which stayed in one place, attached by wires. If you were at home, you probably had a phone at home. The whole family could be reached by one number. I'm going to tag Joy here because I saw something on her Facebook wall. She shared a cartoon that said: "In the old days we answered the phone without knowing who it was at the other end." The caption Joy had put on it was 'because weirdos never called'. Too true. Anyway, this meant that public places had call-boxes. You put in a coin to make a call. You stood in queue for the phone if others who wanted to call had got there ahead of you. And our half of the building, the Commerce College half, had no call box. We had to go into the Law College ('their' territory) each time we wanted to phone someone. This was plain insulting. It was not cool. It was bad. We campaigned. A guy from my class went to the phone company, found out all the rules, and confronted the Principal with a plan of action. If needed, all of us would pay additional money each month, but we wanted our own phone. The biggest triumph of my college days was that one of my classmates got a pay-phone installed on our side of the building. His son attends college there now. Everything is as we'd left it, I think - except -- except his Dad's biggest trophy, the pay-phone. It's outdated. All very well and nostalgic, you're saying by now (if you've read this far), but what's the point? Why are an old woman's mumblings in this Mystery Newsletter? Well -- hasn't a lot of what you've read so far been a mystery to you? If you're as old or older than I am, do you remember those days ... and if you're younger, can you even imagine the scenario? And yet, you know, I'm not THAT old. I'm fifty-one. There are lots of people around who are older than I am and can remember stuff I don't know about. Which is what my point is. This isn't that much of a mystery. This stuff is in living memory. Some people still do this stuff. Dad and I occasionally type something out on the manual typewriter, if we don't feel like putting the computer on. There are still phone booths around, I believe in Britain they are used for books people want to give away. So anyway, if you have a setting, and clues, that point to a particular character, or are red-herrings, you could 'date' the stuff. Like carbon paper and white ink. Use it as a clue somewhere. Have the click-clack of a typewriter somewhere. Have someone talk of 'coins for the phone'. Stuff like that. Might give a new angle to your mystery story. Memories of love never fade. The hospitalized race car driver read the race report. For WC, a Neuvain form of poetry. This is supposedly a true account. I'd featured these in my last mystery newsletter, so here they are again! Only we will know the truth. My last mystery newsletter was ages ago. So long ago that I'm going to have to ask you to be detectives. Your question? 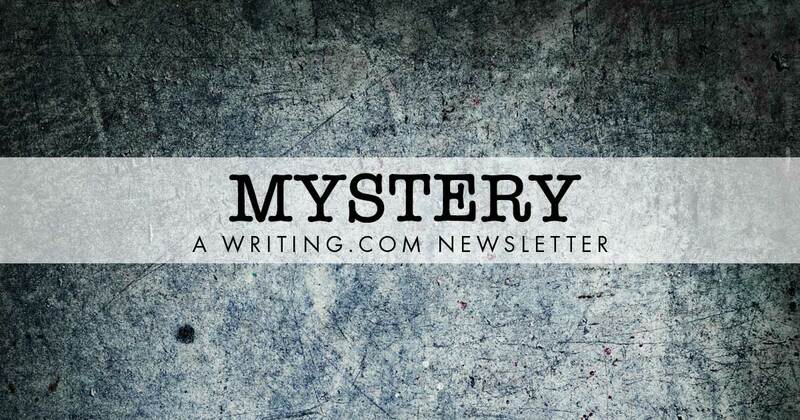 When was my last mystery newsletter? Your clue? The link there. And after you've dug out the date, drop me a line in the comment section below, and include what you thought of this edition of the newsletter, please! Generated in 0.54 seconds at 6:57am on Apr 24, 2019 via server WWW2.